Dr. Oz Claims Sea Buckthorn Is A Miracle For Clearing Up Acne Prone Skin! 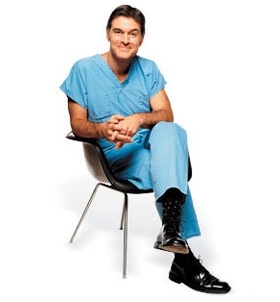 On his January 7, 2010 show, Dr. Oz prescribed Sea Buckthorn oil as a means to fight your acne, saying that the essential fatty acids and Vitamins A, E and C in Sea Buckthorn oil remedies the worst symptoms of acne, both internally and externally. Cysts (deep infections which occur as painful, sometimes red bumps but resist the extraction of their contents). Research shows that Sea Buckthorn softens and strengthens the skin and reduces scarring, swelling and inflammation, allowing the skin to finally break the inflammatory cycle and heal itself. No need to spend a fortune on man-made products that may wind up actually damaging you skin. When used topically, Sea buckthorn oil is a great natural cleanser and exfoliator. In Various testimonials, many Sea Buckthorn users reveal their skin is clear and healthy for the first time in their adult life. Review sea buckthorn’s benefits to skin and beauty here. 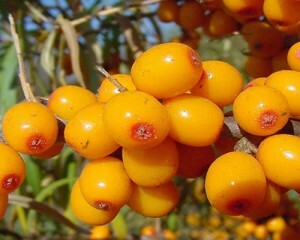 In addition, Sea Buckthorn has been known for Centuries as a “hormone regulator”. How many times have you awakened to a big zit on your nose? Or, how about that blemish that appears right before that big date? Men and women, young and old are affected by hormones and stress daily, it can’t be avoided. But when used orally, Sea Buckthorn significantly reduces the formation of acne due to stress and hormones. Add it to your diet a bit before the big dance, or that crucial Mid-term to prevent those facial disasters. And Rosacea sufferers, no need to worry, Sea Buckthorn’s soothing and healing qualities will provide another effective approach to relieving the irritation and discomfort often associated with rosacea. Users say that within 24 hours of using Sea Buckthorn topically, they saw a dramatic change in overall redness, swelling and pain. Read more about sea buckthorn for rosacea relief here. Lather with Sea Buckthorn soap. With fingertips only, move up and in, in circular motions, pressing very lightly. Massage for up to 30 seconds, moistening fingers as needed. Don’t neglect your eyebrows, hairline and jawline. If you suffer from ocular rosacea, finish by gently washing your eye area. Avoid pulling the skin. Gently pat face dry with clean washcloth. Next add a few drops of Sea buckthorn oil to your finger tips and with the same massaging motion, apply it to your face. The oil contains so much vitamin C and Omega 7 that it stains the face orange a bit, don’t worry, that’s what you want and it will naturally disappear by the morning. Your face will get very soft after a few days of treatment with Sea Buckthorn. Overall, the uses for Sea Buckthorn are tremendous. Used daily, you’ll see your acne and Rosacea subside, revealing natural healthy and beautiful skin underneath. Make room for this wonder fruit in your beauty regimen. 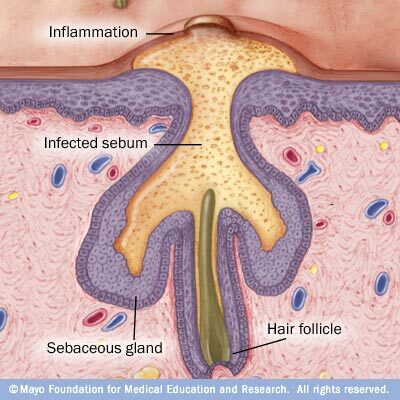 Learn about other skin ailments sea buckthorn can relieve here. 66 Responses to Dr. Oz Claims Sea Buckthorn Is A Miracle For Clearing Up Acne Prone Skin! The Berry Oil has almost all of the Omega 7 content which is excellent for the skin, hair, nails, and mucous membranes. It’s also full of beta carotenoids thus the rich orange color. It’s good for both internal and external use but shines externally. The Seed Oil has almost all of the Omega 3 content and stronger antioxidants. It’s nutritional profile is also more robust. Again, it’s good for both internal and external use but shines internally. It’s really best to take a blend internally if you can to reap all the benefits of sea buckthorn! Thanks! If I taken berry oil softgel orally,can it reduce and healing acne? And also make face skin smooth ? Many users have experienced improve skin tone and smoothness from supplementing with sea buckthorn berry oil. Dr. Oz even mentioned it as a miracle for acne. We’d recommend taking it internally but also applying the berry oil topically on your skin to nourish and balance the tissue. Hi there is seabuckthorn safe for endometriosis when taken for acne? Is this also good for teenagers suffering from ance? Sea buckthorn is safe for people of all ages and even pets. It would be great for any skin issue at any age! You can check on some of our sponsored ad links and those companies may be able to help you with that. We are really just here to provide general information about sea buckthorn. I have suffer from Subtype 2 Rosacea for over a year now. I can say I have tried everything to get rid of this aside from lazer .My dermatologist prescribed topical medications and an oral pill however I learned I was allergic to the medication. Since then I went the “all natural route” and have adopted a Paleo diet, am currently seeing a Naturopath doing live blood cell analysis and colonics to help figure out how to heal / cure this. I have tried all natural cream and cleanser with healing properties in it and still no extreme results. I still suffer from Pustules and the redness gets worse around my menstrual cycle. I am desperate fro help. Do you think this will do the trick? I know how hard it can be to deal with a chronic skin condition but don’t give up hope! Please read our article about rosacea here. Not sure if you’ve ever looked at this forum but it’s a big community of rosacea sufferers. In this article some members discuss their results with seabuckthorn and it all looks very positive. Sea buckthorn is known to increase moisture, reduce inflammation, moderate the immune system and it even has an anti-microbial effect! It does seem very promising that sea buckthorn could really help with your rosacea. If nothing else, it seems like it’s definitely worth a shot before trying lazer treatment. I hope that helps and please check back in to let us know how it works for you. Sea buckthorn berry oil is great for helping with acne because of it’s anti-inflammatory and analgesic properties. It can strengthen skin cell walls and regulate oil production in the skin. The best approach would be to take sea buckthorn oil internally, as well as using it externally.You will get faster results if you do so. Find a sea buckthorn based soap to wash your face with, then dry skin and apply oil to blemishes. Just a warning, the oil from sea buckthorn berries is a dark orange. It will not stain your skin but it will stain fabric! After applying the oil, let it soak into the skin for at least 15 minutes, then wash it off. By letting it sit on the skin, the oils will absorb. You will probably want to do this as a nightly treatment because of the time it takes and because of the bright orange oil on your skin! For best results, also consider cutting down on inflammatory or irritating foods in your diet for a while, drink lots of water and switch to all natural skin care products. For more information on how sea buckthorn effects the skin check out this article and this article to help navigate the purchasing process of sea buckthorn oils. Thanks for your comment and good luck! I just purchased the sea buckthorn berry oil for clearing up mild, annoying acne. I’m having trouble figuring out how much I should out on my face and for how long I should leave it there. I don’t want to overdo it and possibly make it worse, so please let me know how often I should be applying it and for how long I should leave it on my face! Thanks! Great question! A little of the oil goes a long way so just start with a drop or two on your face. Massage it into the skin and let it sit for at least 20 minutes to really let the goodness from the oil soak in. You can leave it on your skin for as long as you want but most people will wash it off with gentle soap and water after an hour or so. You may have also noticed that your berry oil is a dark orange color. Don’t worry, it won’t stain your skin. It will stain fabric so don’t sleep with the oil on your face and while doing treatments don’t wear light colored fabric. Sea buckthorn oil has anti-bacterial and anti-inflammatory properties. It really helps to smooth out scarring on the skin as well. Lots of people love using it for acne. Can a pregnant woman also use the oil? Must the oil and bar soap be used simultaneously? I mean, can you substitute with an aloe-Vera content bar? We always recommend talking to your doctor first! Sea buckthorn can effect your hormones so make sure you talk to a doctor or an herbalist before you start. If you are trying to eliminate acne, we suggest using sea buckthorn oils internally as well as externally. Pure sea buckthorn seed oil will soak right into your skin and is great for healing scars. Fruit oil is great for scarring as well but doesn’t tend to soak in the same way that the seed oil does. You definitely can use another kind of bar, there’s no harm in that. Just make sure that the bar or products you use are noncomedogenic (meaning not pore clogging). There are lists of online so you can look up what ingredients are pore clogging and which aren’t. Hello I have deep acne scars. Can sea buckthorn help me? Thx for ur response. Sea buckthorn is wonderful for helping heal scar tissue. Both the fruit oil and the seed oil are great for supporting cell health. The fruit oil in particular is great for aiding with softening scar tissue because it is so high in Omega 7. You can apply the oils directly to your skin as a treatment. If you get a high quality, undiluted version of the fruit oil, it will be a dark orange color. You can use it as an at home treatment where to let the oil soak into your skin for an extended period of time then washing it off. You will need to wash it off so it doesn’t stain fabrics when you get in bed to sleep at night. Alternately, you can add the fruit oil to lotions or other body care products in small amounts to mitigate the dark color of the oil. There are also lots of sea buckthorn skin care products on the market these days which are very helpful with softening scars. Just be careful to read the ingredients panel before you start using them. Many products use Sea buckthorn in the product name but have low amounts of sea buckthorn. Sometimes, lots of filler oils which may not have the same effect for helping with your scars. It may also help to take a supplement internally as that will help with the overall softening of your skin. I am 48 years old, I just recently found out that I have Rosacea. I have never had any type of face acne, etc. I was totally shocked when I started breaking out. I went to the dermatologist and they told me I have rosacea. They prescribed Finacea and I had a bad allergic reaction. I really want to try these products. Should I use the sea buckthorn soap to was my facethen apply the sea buckthorn oil letting stay on for 20-60 minutes and take the berry softgel capsules orally. I currently wash my face with dove unscented. First of all, lets talk about your face wash. We suggest to stop using your current facial cleanser to try a more natural product. Try a sea buckthorn face wash if you can find one. We looked up your brand of face wash and it has a lot of unnecessary chemicals that could be irritating your skin. You may find that there are many sea buckthorn cleansers and lotions on the market. You may want to try them all right away but take it slow. Start with a simple face soap and see how your skin reacts for a few weeks before starting your oil on the skin treatment. You may find that just switching to a more natural soap may help your condition improve right away. Once your skin is used to your new facial soap, start the oil treatment. Sea buckthorn fruit oil is dark orange but is great as a skin treatment. Watch out for staining your fabrics! The seed oil is another great one for the skin and is a lighter yellow color. You can start taking capsules right away. The cause of Rosacea is not known but it is thought to be an inflammatory condition. That means in addition to using sea buckthorn (which does have anti-inflammatory properties) products you should also investigate your diet and lifestyle. Look into anti-inflammatory diets and try to cut out foods that can cause inflammation. All in all, just try to take it slow. See how your skin reacts to different changes in diet and products. Read more about rosacea and experiment with different options to find the perfect treatment for you. Everyone is different! I purchased the sea buckthorn facial soap. Will this facial soap help with dryness or should I use a moisturizer with the sea buckthorn facial soap? If so what are some moisturizer that’s good and won’t dry my skin even more, I have very dry skin. Sea buckthorn products can be found in most drug stores and in health food stores these days. If you can’t find them in your local store, you can purchase them from online retailers. Hi there I’ve had acne for 12 years now. It seems like nothing works. I want to try this oil but not sure if this is to be used alone or mixed with another type of oil. I also would like to know what type of oil can be used as an everyday moisturizer that can be used under makeup. Thank you. The oil that is really great for skin ailments is the fruit oil because of it’s Omega 7 content. If you get a good brand that is made of pure, high quality fruit oil, it will be dark orange. It works great as a treatment on it’s own but wouldn’t be suitable to wear underneath makeup everyday. A great solution would be to simply take a few drops of the oil and add it to your existing facial cream. There are also plenty of facial creams that have sea buckthorn oil in them already which will not leave your skin orange. If you choose to buy a sea buckthorn infused facial cream, make sure it has high levels of sea buckthorn and natural ingredients. Serums work wonders too because they deliver healing nutrients deep into the skin. For people who suffer from chronic acne or have sensitive skin, it is crucial to use natural and gentle skin care products. Read your labels! Acne can be caused by many factors and trying to treat the issue internally should be part of your action plan. You should also try to take the oil internally, either in a capsule or as many companies sell it, in dropper bottles. For internal use, you should try a product that is a mix of both the seed oil and fruit oil. The seed oil is high in Omega 3 which is best known for it’s anti-inflammatory properties. That could help your acne tremendously. Overall, you should attempt to treat our acne internally as well as externally for best results. I applied sea buckthorn to my face a few hours ago, my face is red and irritated, is that normal? No, most people say that sea buckthorn oils are very soothing to the skin. What kind of oil was it, for example, fruit or seed? What was the name of the product that you used? Let us know and maybe we can help you figure it out. Did you use any other products on the skin that day? Hi, I am a little be confused about using SB BERRY oil or SB SEED oil. I am 41y old and prone to acne, due to hormonal imbalance, thyroid problem. Due to a lot of benefits of SB oil for hormonal imbalance, aging, acne and etc, I would like to try to use SB oil internally and externally. You advise to use SB BERRY oil for acne, but SB BERRY oil, compare to SB SEED oil, is more richer with OMEGA-9, than OMEGA-3 and OMEGA-6. HERBAL specialists do not recommend for people with hormonal acne to use OMEGA-9 in high dose. Which I agree. I have checked on myself. I use on my face only oils with high level of OMEGA-6 and low level of Omega-9. It works very well for me. What is the best to use for hormonal acne SB FRUIT oil or SB SEED oil? Both the fruit oil and the seed oil have Omega 9 in addition to the other constituents of the oil, that is true. We suggest the fruit oil because most people react quite well to the Omega 7 because of it’s cell nurturing properties. On the other hand, there are plenty of benefits to be offered by the seed oil as well. Sea buckthorn seed oil does have anti-bacterial and anti-inflammatory properties so it actually works wonders for the skin as well, just in a different way. If you know that Omega 9 does not work well with your skin, we would definitely suggest just sticking with the seed oil. It’s hard to say exactly what kind of oil will work for you because we are all so different. Many folks say that the berry oil works wonderfully for their skin ailments, while others prefer the seed oil. There is no one-size-fits-all answer. Luckily, it seems that you know your skin type very well and have been trying different solutions. You are absolutely correct, the fruit oil typically does have more Omega 9 than the seed oil. Truthfully, the amount of Omega 9 is only slightly higher in the fruit oil than the seed (usually around 5-10% more) so there isn’t that big of a difference. If you were to take either one, the actual amount of Omega 9 in a full serving would likely be less than one gram (.3 grams or around 300 milligrams) at it’s highest amount. That is not an especially high number and mostly likely not enough to cause concern. However, if you know that a combination of 6 & a lower dose of 9 works well for your skin type, just stick with a seed oil only product. Hope that helps, thanks for your question! No doubt that sea buckthorn oil has lots of beneficial features but I don’t know that, it can clear acne also. Thanks for sharing the informative post. I am applying a sea buckthorn oil every morning and night for about 2 weeks now but it seems that acne got much worst than before. Is it some kind of stage before it gets better or would you advise me to stop using it? Sorry to hear that you are having trouble with your oil regimen. There are so many factors that could be causing the issues you are having, it might not just be the sea buckthorn that is causing your problem. To be on the safe side, we would suggest to stop using the oil externally, so that you can figure out what is causing the irritation. If you were already suffering from acne before you started the SBT treatments, that means you are most likely prone to sensitivity. The theory of using oil on the skin is not just that it rehydrates, it also dissolves other oils as well as dirt within the skin. It could be possible that you have dissolved some of the harder sebum caps on your skin and that your pores are simply draining. Some acne sufferers are so sensitive that they are at higher risk for infection. It could be that you are unclogging your pores, which is a good thing, but you could be experiencing an infection as well. This especially common for those with acne who are doing an oil cleanse (which is when you forego the use of soap all together). Another factor to consider is what kind of oil are you using on your skin. Is it pure sea buckthorn? Many companies offer oil blends that have SBT mixed with other kinds of oils. Make sure you are using a pure SBT oil. Is it a blend of fruit and seed oil, or is just the fruit or just the seed oil? The fruit oil has Omega 7, so it is typically considered the best for skin ailments. The seed oil has Omegas 3,6,9 which are great for skin as well, but is less known for it. Although the Omega 7 from the fruit oil is specifically great for skin, it’s not as “dry” of an oil as the seed oil is. “Dry” oils tend to be absorbed into the skin faster than wetter oils. So, it could be that you are using the fruit oil twice a day and it’s not absorbing fast enough, causing more irritation than before. It could be that that two applications a day is simply too much for your skin to handle at this time, regardless of the oil type. Yet another factor to look into is the soap or other products you are currently using in conjunction with the SBT oil treatment. Have you changed the cleanser as well as adding the SBT oils to your regimen? This could cause irritation by changing too many factors at once. What kind of ingredients does your current cleanser have? Is it full of lots of complex chemicals or is it more natural? What other products are you using in conjunction with your oil regimen? Yes, for now it would probably be wise for you to stop using the oil regimen in the same way that you are doing now. However, you may want to start taking the oil internally as a dietary supplement (this depends on what kind of product you have of course-make sure you can also take it internally first). Many people are surprised to learn that lots of skin issues are caused by internal problems, such as food allergies, stress or lack of proper nutrition. Sea buckthorn works amazingly well for skin when taken internally because it’s packed with dense nutrition and lots of Omegas. It is also a great option for those with particularly sensitive skin. It couldn’t hurt to see a dermatologist if you can, just to be sure you do not have an infection on your skin. Try to simplify your routine, examine the products you are using as well as other factors like your diet and stress levels. Keep trying and you will be able to find the balance of what works for your individual skin type. Hope that helps and thanks for your question! I’m so late here…I’m suffering from hyperpigmentation and someone advised me to get the fruit oil softgel..to open it up and apply it directly on my face..that it will help fade the pigmentation…is this true? Can the softgel help? I hope someone replies me. Yes, the fruit oil is great for skin because the Omega-7 supports healthy cells and moisture with Omegas. Something that really helps when it comes to hyperpigmentation on skin is antioxidants. Again, the fruit oil is a great choice because of it’s natural vitamin E content but the seed oil has even more antioxidants than the fruit oil. So in short, yes the fruit oil works well but the seed oil may be even better. Using both internal as well as external should also help your cause greatly. I have been taking the seed oil for about a month now (started out 1 a day and now taking 2) and my skin has improved but still have some dryness on my nose with redness (Roscea) and was wondering if I took 1 seed oil capsule and 1 fruit oil capsule each day if it would improve more….both capsules at the same time or different times. As you may know, the cause of Rosacea is not known and because of that there is no cure for it. However, sea buckthorn is a great solution to help you deal with the symptoms. We have seen sea buckthorn products that allow you to take up to four capsules per day. Check the label of the product you purchased to ensure that a higher dosage is okay. We would suggest taking both kinds of oil, as the seed oil as antioxidant properties and the fruit oil has anti-inflammatory properties. Also continue the topical use as well. I am pregnant and would like to use body lotion with sea buckthorn for my very dry skin. I have read that sea buckthorn is not recommended in pregnancy so would like to know can i actually use this body lotion? Yes, using a body lotion with sea buckthorn oil is completely safe! You can even safely use the pure oil directly on your skin as well. Thanks! Hi I want to know if sea buckthorn works on dehydrated skin. I have dehydrated lines on both side of my cheeks, so I want to if oil will help skin plump up? Should I take capsules and use face oil? Yes, sea buckthorn oil is great for dryness issues. You should take the oil internally and also do treatments on your skin with either pure oil or skincare products. The fruit oil makes a great weekly treatment and seed oil is good for everyday touch ups. That’s because the fruit oil is bright orange- rub some on your skin and let it sit for about 30 minutes. Any oil that hasn’t been absorbed can be washed off or wiped off after that. The seed oil is a lighter yellow color and your skin will completely absorb it in a few minutes, so you can use it beneath your facial lotion each day. Sorry for the delay, looks like I missed your question last week! Sea buckthorn oil is great for supporting skin health overall and helping “re-balance” the skin. It’s not known to shrink pores to our knowledge. But if the large pores are being caused by some kind of imbalance in the skin it could help. That is an educated guess, can’t say for sure. after the reading this i will try this oil. I am 22 and suffer from PCOS. I have cystic acne and am looking for some help. Because my acne is more hormonal I feel like I should be trying something orally to combat the acne before it comes out on my face and back. What would you recommend? It sounds like out berry oil product would be best for you. The berry oil is great for skin health and might reduce your acne. You can try the pure berry oil on it’s own and add it to things like smoothies or already cooked meals. You should also consider the Omega 7 complete which has both oils in it creating a balance most similar to the berry itself. I have started using the oil externally on face a week back to heal my acne..how long will it take for acne and acne scars to disappear? There is no guarantee for how long the treatment will take to work on your skin. The oil works by slowly softening the scars allowing them to fade easier. In addition to the oil, using an exfoliating face sponge or soap during your skincare routine may accelerate this process. This was a wonderful informative post you shared on this page with the outstanding steps to destroy the black moles and deep acne scars from face naturally at home from the Sensitive skin of hand in a seven days by using the hemp seed oil daily according to the period of a time after the recommendations of a doctor to get spotless skin with the usage of skin care products and remember the instructions of a doctor which help you to destroy this kind of disease rapidly , You must go to a doctor one time in a week for starting of proper treatment to destroy the black moles and deep acne scars from face naturally at home appeared on the Sensitive skin of hand and finger in a summer season due to the effect of sun rays,Keep it in your mind don’t work in the light of sun because the heat of sun with the dust particles of sun rays increase the disease of black moles and deep acne scars on face skin naturally due to the demaged of skin layers cells after the working of some time you notice the color of skin become black and deep acne scars are increased on the Sensitive skin of a body this is also a effect of skin cancer . So take care of skin and avoid to work in a light of sun . you also use a mask on the face if necessary to work in the light of sun and also use carrot in the food salad . Hello I just had a quick question, I am currently taking L-lysine tablets for my ance and was curious as to if sea buckthorn tablets would mix ok with it? Is it safe to take together? Yes that should be fine. The only thing that may not mix well to our knowledge is medications for blood clots or high blood pressure.